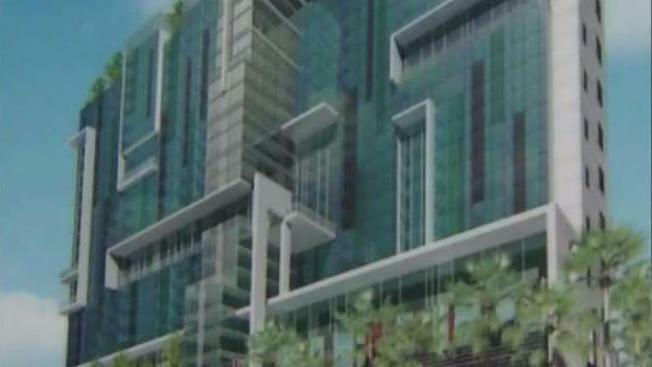 San Jose city leaders are targeting a vacant lot near City Hall for development of a high rise, but critics say the land is contaminated with at least one toxic chemical, and they've filed a lawsuit to ensure it's cleaned up. Attorney Tanya Gulesserian says there's "a leaking underground storage tank, which caused contamination on the property site" that once featured a gas station. "Require the city to disclose, analyze and mitigate potentially significant impacts so this site can be safely developed," Gulesserian said during a news conference Thursday. The lawsuit says the city read the county report but ruled that re-zoning the property for joint commercial and residential use would result in no significant impact. The city attorney's office said the project isn’t ready for an environmental impact report, but one will be conducted at the appropriate time. "This is very personal to me," Oller said. "I mean, it's a nasty place. When you break the blacktop up, you have some serious dirt underneath there."